Direct liabilities of the United States government are often referred to as the "national debt." There are a variety of terms used to refer to the national debt, such as the public debt, debt held by the public, and gross federal debt. The most meaningful of these concepts is debt held by the public, which measures the cumulative outstanding amount that the US government has borrowed to finance budget deficits. As of the end of March 2019, the current US Total Public Debt Outstanding stands at just over $22 trillion. This includes $16.2 trillion in debt held by the public and $5.8 trillion in intragovernmental holdings. We added approximately $1.5 trillion in debt in 2018, with most of the increase occurring in the debt held by the public category. According to the Congressional Budget Office, the federal government budget deficit was $779 billion in 2018, and this figure is projected to rise to $897 billion in 2019. This will further increase the national debt. There are many misconceptions surrounding the national debt. Perhaps the most egregious is the unfounded belief that other countries, namely China, own most of our national debt. This is simply untrue. 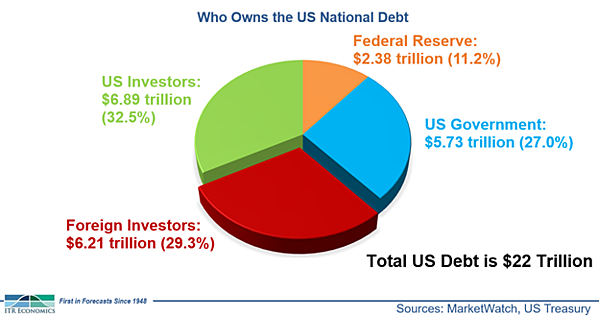 As can be seen in the chart below, the largest single owners of the US national debt are US investors, with nearly $6.9 trillion, or 32.5% of the total. The Federal Reserve and other US government entities hold approximately $8.1 trillion, comprising 38.2% of the national debt. Foreign investors own the remaining $6.2 trillion, or 29.3%, of the debt. Of those foreign investors, it is true that China is the largest: The Chinese government owns approximately $1.12 trillion, or 5.1%, of our total national debt. Japan is also a significant holder of our debt, with $1.04 trillion, or 4.7% of the total. In other words, China and Japan combine to own nearly 10% of our national debt. There is a notable gap between these countries and the rest of the world. Brazil, Ireland, the UK, Switzerland, Luxembourg, and the Cayman Islands all own between 1.4% and 1.0% of our debt. The economic reality is that we need to recognize that we are living beyond our means as a country, and we need to take the painful yet necessary steps to address the problem. Put simply, we have to find ways to either spend less money or increase our income, or both. Our lack of resolve to fix the debt problem is a key contributor to ITR Economics' long-held view that a second Great Depression will arrive in the 2030s. If you would like to learn more about our prediction for the coming Great Depression, please reach out to us!